This Melbourne guide to Australian art covers the whole range of art – from aboriginal art, to the Melbourne Impressionists, to the art of today. Indigenous, or Aboriginal art goes back not just a few hundred years but tens of thousands of years – a totally different order of magnitude. The foundation to Aboriginal life and art is the Dreaming. Dreaming is the aboriginal way of understanding the universe. It explains life, the spirit and the creation of trees, waterholes, rivers, mountains and stars, the animals and plants that inhabit this world. It determines Aboriginal values and relationships with other living beings and the land. It is their spiritual renewal and nourishment, and establishes their responsibilities to life and the land. Aboriginal art – dance, song, storytelling, painting and artefacts - are ways of communicating the dreaming. The Ian Potter Centre, the Australian part of the National Gallery of Victoria has a great section on Aboriginal art. There are also numerous galleries around Bourke Street and Flinders Lane that have great selections of indigenous art. They also have a great section on Australian Impressionism. The next great art movement in Melbourne is the Heidelberg school of arts. It began in the late 1880s, when a group of artists set up camp at Box Hill. They painted ‘plein air’, which is painting outside directly from nature rather than in a studio. This grew into a movement of painting at “artists’ camps” along the beautiful bends of the Yarra. It became known as the Heidelberg School, named after a picturesque rural area, which is now a Melbourne suburb. 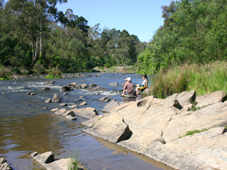 Many of the scenes painted are still recognisable along the flood plains of the Yarra. Artists include well known names such as Tom Roberts, Arthur Streeton, Frederick McCubbin, Jane Sutherland, Charles Conder and others. This lively artist’s community formed the first Melbourne artist’s colonies, a reflection ‘Marvellous Melbourne’ - made possible by the wealth of the Gold Rush. They are referred to as the Australian Impressionists as their style is reflecting that of international impressionism. However, the Heidelberg School stands on its own. It has been the first Western art to realistically depict the Australian landscape, including its harsh sunlight, earthier colours, and distinctive vegetation. 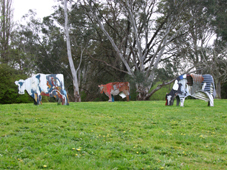 The Yarra trail guides you through the paintings and scenes of the Heidelberg School. Montsalvat is a later artist's colony in Eltham, a little bit further out along the Yarra. It was established in the 1930s and incorporates over a dozen buildings, set in rich established gardens. Its vision was to nurture and practice the arts. You can still visit these buildings – there are still used for exhibitions, art classes and performances, ant it is still home to resident artists. 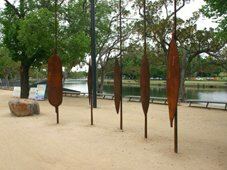 The Heide Circle was a group of artists between the 1930s and 50s that lived and worked at “Heide”, close to Heidelberg along the Yarra. It has now become the Heide Museum of Modern Art . The Melbourne guide to Australian modernists includes famous names such as Albert Tucker, Sidney Nolan, Arthur Boyd, John Perceval and Joy Hester. The ‘Angry Penguins’ evolved from the Heide Circle as an early literary and art movement of Australian surrealism and expressionism. During the 70s artist-run initiatives, supported by the Victorian Arts Initiative began in Melbourne Australia. They are organisations continuing to enrich our lives through the support of new art. They are established by artists to give them self-determination and opportunities to exhibit. The Gertrude Contemporary Art Spaces are an example of such non profit contemporary art complex. They provide gallery spaces and studio facilities, providing professional support to artists in the early stages of their careers.